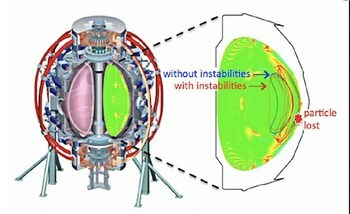 Schematic of the NSTX tokamak at PPPL with a cross-section showing perturbations of the plasma profiles caused by instabilities. Without instabilities, energetic particles would follow closed trajectories and stay confined inside the plasma (blue orbit). With instabilities, trajectories can be modified and some particles may eventually be pushed out of the plasma boundary and lost (red orbit). Image by Mario Podestà. The gold standard for modelling the behaviour of fusion plasmas may have just gotten better. Mario Podestà, a staff physicist at the US Department of Energy's Princeton Plasma Physics Laboratory (PPPL), has updated the worldwide computer program known as TRANSP to better simulate the interaction between energetic particles and instabilities—disturbances in plasma that can halt fusion reactions. 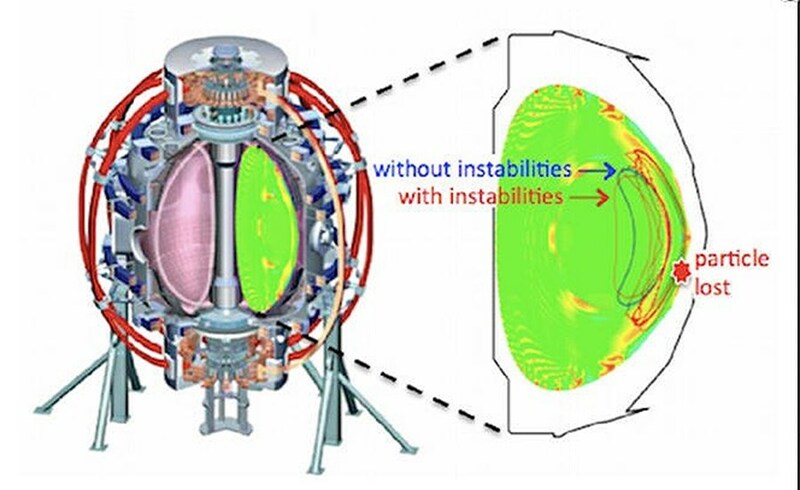 The program's updates, reported this week in Nuclear Fusion, could lead to improved capability for predicting the effects of some types of instabilities in future facilities such as ITER. Podestà and co-authors saw a need for better modelling techniques when they noticed that while TRANSP could accurately simulate an entire plasma discharge, the code wasn't able to represent properly the interaction between energetic particles and instabilities. The reason was that TRANSP, which PPPL developed and has regularly updated, treated all fast-moving particles within the plasma the same way. Those instabilities, however, can affect different parts of the plasma in different ways through so-called "resonant processes." The authors first figured out how to condense information from other codes that do model the interaction accurately—albeit over short time periods—so that TRANSP could incorporate that information into its simulations. Podestà then teamed up with TRANSP developer Marina Gorelenkova at PPPL to update a TRANSP module called NUBEAM to enable it to make sense of this condensed data. "Once validated, the updated module will provide a better and more accurate way to compute the transport of energetic particles," said Podestà. "Having a more accurate description of the particle interactions with instabilities can improve the fidelity of the program's simulations." Read the full article on the PPPL website.